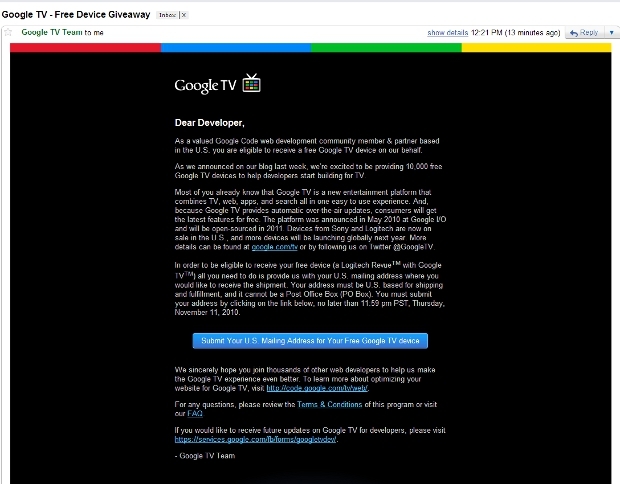 UPDATE: Google got back to us to let us know that the emails below were sent out to its Google Code community (an unspecified number) and that it has not yet taken action on the 2,500 winners of the contest, which is what we thought this was at first. Google says that those winners will be determined according to the published rules of the contest. Also, the email below is separate from the 3,000 Google TVs Google will be sent to those developers that attended the Adobe Max conference.